I fell in love with ramen (restaurant-style, not the cheap instant packages) when I first went to Japan in 1998, and I fell back in love when I returned in 2005. There is such a variety of ways that it can be prepared, and such a plethora of potential toppings, that I could eat it every day and not get bored. When Ginza Restaurant opened in Ottawa’s Chinatown and focused on selling the best ramen I’ve had outside of Japan, I could not have been more ecstatic. (Seriously, try their hakata tonkotsu ramen, it is to die for.) For the longest time it was the only place in town where I could get this wonderful noodle dish. Recently, though, I’ve noticed that the popularity of ramen is slowly growing, and it’s starting to be available all over town, much as Vietnamese pho came to be about ten years ago. If this means that we’ll end up with over fifty restaurants that serve ramen in Ottawa, I couldn’t be more pleased! This was the first non-Ginza ramen that I tried in town, and I was quite ready to be disappointed. The austere food court in the Rideau Centre mall isn’t exactly the place you go for haute cuisine — it’s where you go to grab a quick, mediocre bite. I mean, this is definitely fast food, but it’s cheap ($8.49 for the chicken teriyaki ramen that I had), flavourful, and satisfying. The noodles could use to be a bit chewier (a hallmark of good ramen is the chewy alkaline noodles, which don’t dissolve in the broth), but overall this was worth the money. Ask for it spicy (medium or hot) to clear your sinuses on a cold winter’s day. At $13.49 for takeout and $12.49 for dine-in, this was the most expensive ramen so far. Heck, the most expensive ramen at Ginza is only $11.95! So for that price, I expected more. 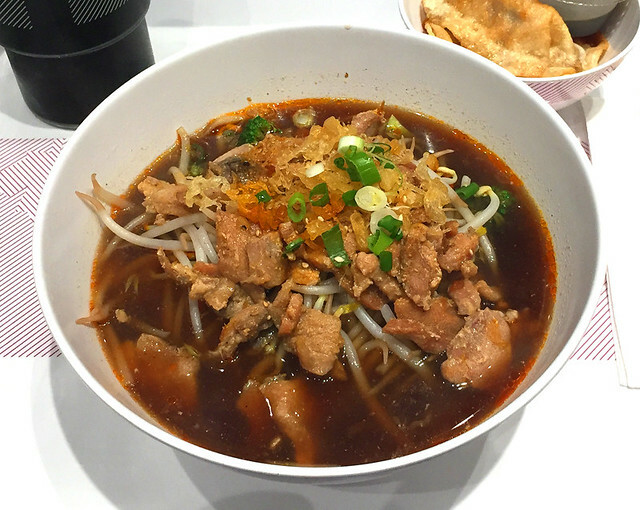 The broth is nice and the noodles are chewy, but they are really skimpy on the toppings. I did like that there were a variety of ways that you could customize your order. I had the tonkotsu black: tonkotsu broth with black garlic oil, pork belly, soft boiled egg, black fungus, and green onion. I just don’t think that you’re getting value for money on this one, though. Nom Nom Kitchen is a little Asian fusion takeout place with a few dine-in tables located in a strip mall directly across from a McDonald’s. It’s not very glamorous, but the food is good, and it’s also very reasonably priced. Their lunch specials are usually around $7.00 and are generously portioned. Ramen isn’t one of their specials, sadly, and it isn’t on their online menu. 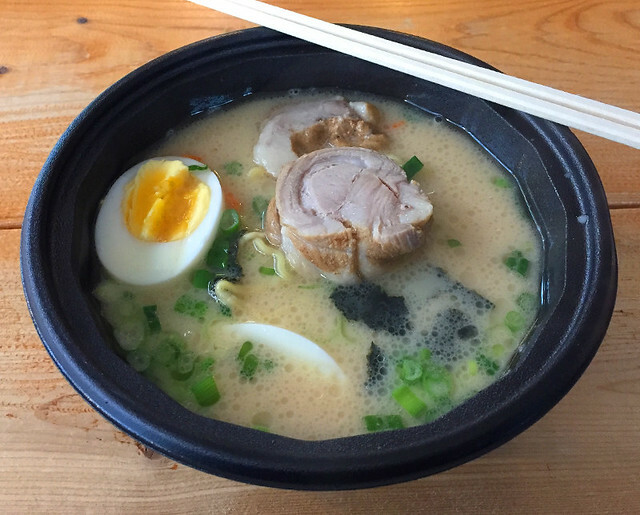 It’s about $10.49 for a bowl of Japanese-style tonkotsu with pork, veggies, and soft-boiled eggs. They also offer a dish that is, I believe, a fusion of Japanese and Korean styles, and is a bit more spicy. Since this restaurant is aimed at a take-out clientele, the presentation is only mediocre, but the flavour is lovely, the broth is tasty, and the noodles are nice and chewy. I only wish that the eggs were more soft-boiled than hard. Even so, I have been back many times now and everyone I’ve taken with me has liked their food. 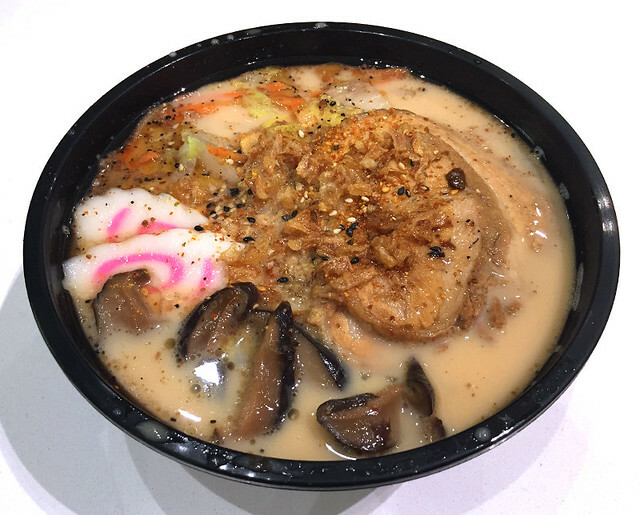 If you value flavour over appearances, I would rank this ramen #1 of the four I’m reviewing today. There are a lot of Bento Sushi locations, most of which you’ll find tucked into grocery stores peddling mediocre takeout sushi. But they do have a few standalone locations, one of which is in the food court of the St. Laurent Mall. Since this is a big chain that isn’t exactly known for its high-quality food, I went in not expecting much. However, as with Umi Teriyaki & Sushi, I was pleasantly surprised. It’s not the best ramen I have ever had, but the broth was nice and the toppings were flavourful. The noodles weren’t as chewy as I like, but they weren’t horrible either. I had their chasu ramen with tonkotsu (from their menu: “thin noodles in a tonkotsu pork broth with carrots, shiitake mushrooms, green onions, and fish cake”), which was $9.99. Overall, their ramen was miles better than their sushi, which may be damning them with faint praise. But I’ll take their ramen over just about anything else in the food court — except maybe Jimmy the Greek‘s pork souvlaki and salad. 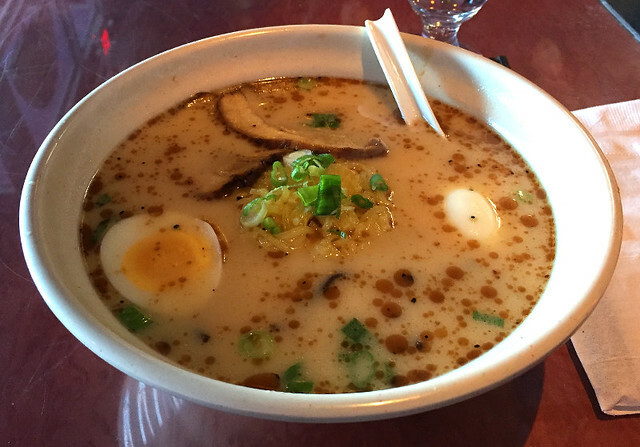 If anyone else has suggestions for ramen in Ottawa that I should try, drop me a comment with the name and location. I’d be more than happy to check them out! I have absolutely no qualms about eventually having eaten at every ramen-serving restaurant in this city. Posted on December 19, 2017 December 19, 2017 by owntwohandsblogPosted in ExploringTagged Asian fusion, fast food, food, japan, japanese, noodle, noodles, ottawa, ramen, restaurant, review, take-out, takeout.